I have reached the age when I need to recapture my youth. As a boy, I was taken each year to the seaside. Some of my most vivid recollections of my formative years are to do with the sensory delights associated with these childhood holidays: the enticing sound of the waves as they crashed onto the shore and the sight of waiters – always very grand and very proper – expertly transferring food from silver dishes to my plate, and doing it right at the table. And then there was the food itself, which seemed unchanging and unchangeable. Magical memories – which have just come surging back at a lovely hotel on the Ligurian coast in Italy. 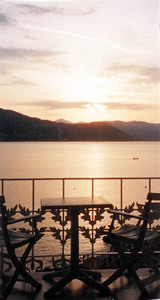 Indeed, at the Grand Hotel Miramare in Santa Margherita Ligure, the years simply dropped away. I need not have begun my dinners at this pristine pile overlooking the Mediterranean as I did. Chef Viviano Panzetta was, after all, offering me such delights as ricotta and spinach cannelloni and bucatini with bacon and tomato. But I could not resist beginning dinner each night in the same way: with tomato juice, to which I added a teaspoonful of Lea Perrin’s Worcestershire sauce (how sophisticated I thought I was, when I did this as a tiny tot), and then with a bowl of thick, hearty soup (ladled out, of course, by the waiter at the table). The latter changed each evening, so I can testify to the merits of Chef Panzetta’s vegetable, mushroom and minestrone versions. My half-board arrangement enabled me also to tuck into other favourites, like entrecote steak, pan-fried loin of veal and pork fillet, as well as puddings from the trolley, like rum baba and cheesecake. All this I consumed in the brightly lit dining room (pictured). (Actually, it became slightly less bright after my arrival, because I asked the kindly maitre d’ Antonio to dim the lights a little.) Waiters in white jackets and black bow ties provided efficient and friendly service, as songs like ‘Moon River’ were played as background music. It pleased me to see such friendly prices on the wine list. 2003 Tignanello, for example, was a tempting 80 euros. 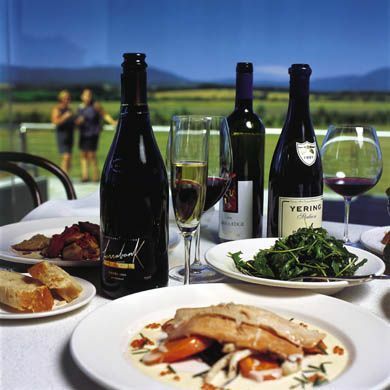 From the bottles I tried from its 150 offerings, I would direct your attention to a local white for only 24 euros, with tones of sherbet and pear and with a fine structure (Riviera di Ponente Vermentino, Laura Aschero, 2006). The Miramare was opened in 1903 in the heart of what we call the Italian Riviera. If you do not already know Santa Margherita Ligure, you are in for a treat. It is a town of charm and elegance, and to the Grand Hotel Miramare have come some famous folk who were charming and elegant themselves. 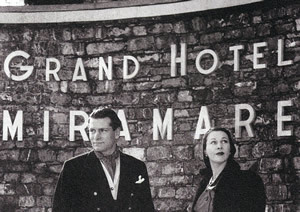 In 1947 Laurence Olivier and Vivien Leigh stayed while on honeymoon, and I reproduce for you a photograph of their visit. A few years earlier, in 1933, the hotel had even claimed its place in the history of communications, when the great Marconi first transmitted telegraphic radio and telephonic radio signals a distance of 150 kilometres from the hotel terrace. 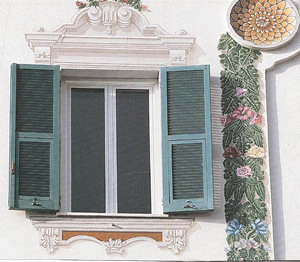 Now the building’s façade has been beautifully restored, complete with its trompe l’oeil frescoes (pictured). The establishment is owned by the Fustinoni family, and Andrea Fustinoni showed me his pride and joy, the hotel’s exquisite and immaculately tended gardens, which run up the hill at the back of the property. They swirl around the swimming pool (pictured), where the bathers can enjoy a gorgeous backdrop of coastline and sparkling sea. This same view blessed my air-conditioned room (pictured), number 209, a ‘Double Sea View’ – and therefore 265-385 euros, bed and breakfast for two, according to season, or 341-461 euros a night for two, half-board. White and pale blue, with a polished parquet floor, this apartment – like the rest of the hotel – was absolutely pristine. The lighting of the hotel’s 84 rooms could be greatly improved if their crystal chandeliers were to be fitted with dimmers – a suggestion I offer in a helpful spirit, for I judged my own stylish billet very good value indeed. Its bathroom was of a healthy size, with green tiles, 2 wash basins, a bidet and a tub of the proper capacity. I particularly enjoyed sitting on my balcony, wrapped in the white bathrobe and playing the part of a reclusive film director behind my Persol sunglasses, with the Ligurian coast set out before me. When the sun shines, which it does often, this panorama is remarkably beautiful. It is true that, between the hotel and its private beach, runs the road to Portofino, which can occasionally be quite busy. At such moments I would retreat to the quietness within, for my room was shielded by very efficient double-glazing. Breakfast was served on the restaurant terrace. Here, protected from the hot sun by a forest of shades, I took from the buffet table plates of bacon, tomatoes and cheese and bowls of Corn Flakes. 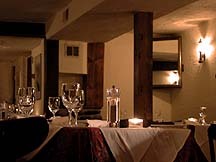 The waiters – as with all the staff I encountered, hard-working and courteous, a credit to the Manager, Adalberto Gigli – brought to me pots of coffee and plates of excellent ham. These starts to the day were leisurely and thoroughly enjoyable. I left the Grand Hotel Miramare feeling a little younger. That is the benefit of recapturing one’s youth: it brings back flashes of innocent delight. And those flashes cause the wrinkles to recede and the grumpiness to abate – at least for a time. For that, and for much more, I am grateful to this charming, well-run hotel by the sea. 16038 Santa Margherita Ligure, Italy.